then too if and when you die and only have elected side respawn then the units you switch into wont have the call heli action. allowing the player decide when the pilot should take off. choose destination should be based on whomever enters the chopper, but only at base. the ok for the pilot to go and proceed to chosen destination. when the heli is to take off and proceed to the destination. In terms of coop you can have it where any player that enters the heli. Yes, it changes. Airlift will no longer stuck at waiting for all defined units to get in, when some of them can't be ordered to get in by any player. Yep. That way can be done too. For the radio call - "choose destination" action may appear for each of defined for airlifting players, as soon heli is landed without any waiting for any other units to board. It will be all up to the players, when the heli will take off, heli can be ordered to take off even without any passangers in such case. For the boarding at base option - the "choose destination" action will appear for defined for airlifting players as soon any of defined units (player or AI) will board any of appointed heli (if they will board more, than one heli, the first counts as appointed). The problem is, IIRC voice comm, when the pilot asks about the destination, assumes, all are boarded. Are we OK with that? But what for? Seems redundant overcomplication. Destination choice can work as signal to take off IMO. Which is better? The second one looks more like actual fast roping, I saw on youtube, the more, in the first case unit holds the weapon in hand, which is kinda like the unit is going down using some carabiner clip? To me, both are good, except the tilt issue. As for door animations/rope attachement points issue decided, attachement points will be chosen procedurally (hopefully with sane results), but doors will be not animated (I see no way to ensure, right one are opened, in my tests with Huron appeared, that procedural choice of doors to be opened is not sufficient, pilot's door are used, result is silly, while that heli has anyway a hatch in the floor or something), but user will have an option to define by hand for each heli animation sources, that should be animated. Ya about all you can do unless theres more lines there, but basically player will have to wait til all are aboard, player/AI to set destination. Agree, but the idea was to add more immersion, dont want to make things to quick and easy, leave it as is. is it just me or does your helo not shoot hundreds of meters into the air when braking towards an LZ? i was looking through the script and possibly "RYD_HAS_AscentCounter" might be responsible for this? Frankly didn't even know, they tend to do that... :) Nothing, I've done consciously. RYD_HAS_AscentCounter is optional function, that may help in very specific (rare) issue, which I saw once at disembarking under fire - when the heli goes up too early, before all are out. It is disabled by default though, as this is kinda brutal "club" code, that fights with heli's native behavioral code. If turned on, it activates only for the last stage of landing. BTW encountered an issue with fastrope disembark. It is about heli positioning over destination spot. Horizontally and vertically. Simply - as always in case of vehicles, aerial especially, sending the heli towards given position is highly inaccurate (wide tolerance of completion radius). It is so due to limited AI maneuverability. Meanwhile precision is crucial here, otherwise units may end on the top of some object/building without a way to go down, to the ground level or be exposed to harmful collisions with objects beneath. Also when player marks one position, while heli unload troops at another position makes whole fast roping idea futile. I'm thinking, workaround may be as brutal, as RYD_HAS_AscentCounter, to force (literally) the heli to move to the pointed spot before fastroping. Or perhaps it will start with invisible helipad landing (which makes positioning very precise), but interrupted befor the heli start to descent. If possible. Another thing - vertical positioning. Not sure yet, but wanted to use FlyInHeight, and from what I saw, it may not work too well, need to test more. Speaking of FlyInHeight, can we have the ability to define a flying height enroute to the landing area? For example, pick your destination then pick the flying height, with the ability to change as needed. Dudas rappel script is pretty awesome for fast roping. C2 - Command & Control by Mad_Cheese has a feature similar to what you're going for with Duda's aforementioned script/mod as a dependency which also detects if the waypoint is on a building, might want to check it out to see how he does it, if you haven't yet. Speaking of FlyInHeight, can we have the ability to define a flying height enroute to the landing area? Tested this yesterday. There will be such option, but only in user config, not at each call (I could, but frankly, I hardy see a point to implement such possibility, what for?). Anyway, FlyInHeight is ignored for altitudes considered as too low by the engine apparently. You can set, say, 200 meters, and it works, but if you set 20 - will be ignored, and, I guess, for a reason (collisions with tall objects). When solving the issue of precision of fast rope drop I've made a function, that applies calculated 3D velocity vectors, like 10 times per second, to bring helicopter to the chosen spot with few meters accuracy at chosen by the user config altitude (+ possible some meters, if needed to avoid collisions with nearby buildings). It works for small, precise amandements, but it's too rigid for constant use, so this is no go as for flyInHeight replacement during whole flight. Also, since usually heli considers a waypoint completed/stops around 80 meters before reaching it, I've made, so actual waypoint position is moved 80 meters beyond drop position, assuming straight A-to-B flight path, which is quite helpful too, and even before any amandements heli is positioned quite close. Mentioned temporary, interrupted landing on invisible helipad way of precise positioning was kinda working too, but not reliable, sometimes heli no matter what was insisting to nearly touch the ground before fly away, even if landing interrupted, and helipad deleted. I'll not reveal a big secret if I say, AI routines are flawed. which also detects if the waypoint is on a building, might want to check it out to see how he does it, if you haven't yet. I think, I got this my way. There will be an option to set custom search radius for building objects at the drop spot. If set to, say, 15 meters, it will ensure, final spot will be free from buildings (except those of >15 meters radius). But if user want, may set it to 0. Then fast roping will be conducted as close to the clicked pos, as possible for the heli, which may be used for rooftop fast roping. Rooftops are considered as for rope length etc. Of course, despite some small safe code, I adwise against it as for AI groups, as they tend to jump down from the rooftop to stay in formation. AI on the rooftop usually equals troubles as soon they try to move, still, there will be such option. My next "to do" before 1.1: ammo drops. I'm thinking, should I do it via slingload, via parachute or some combination of both? Regarding slingload, tested "HOOK" waypoint. It's semi-broken in a way - heli (Huron) was at first postion itself properly, but no rope was created, then it was randomly circling long time over the supply box area, then finally tried again and hooked the box properly. Weird. I wonder, if good enough... At the second try it was same, but this time Huron made second attempt much faster. At third Huron started from afar, and this time it worked at first approach. An issue with maneuverability when target too close from initial position perhaps. I think, I'll make it optional, if the box should be slingloaded, or dropped via parachute. Sorry for late reply...just saw this. Within an EachFrame eventhandler, I move the unit down with this setVelocityTransformation code. The vectorUp and vectorDown is hardcoded in that statement below. 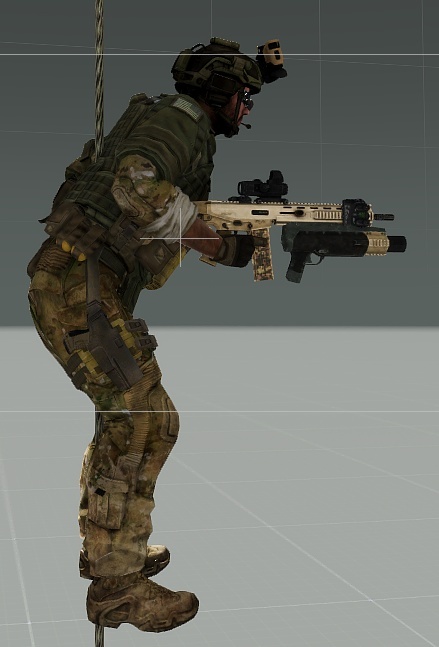 Your other animation is fine, and may be more realistic (but mine has fun factor of weapon in hand). Does, what I described. If a box is 50 meters or more roughly ahead of landed Huron, the more if the heli is of smaller and more nimble kind, it seems to be enough space for maneuver to lift the box without described issues. I move the unit down with this setVelocityTransformation code. So far never tried setVelocityTransformation. I definitellly want to test this, thanks. i was noticing some glitches on hooking cargo so i think i'm going to abandon that method i posted in favour of the waypoints now ;) like you say as long as the heli has enough room to maneuver into position first waypoints work fine. Wanted to let you guys know if it helps any the mission KP Liberation has a slingload component in it you could look at, idk where the script is or what code is used. 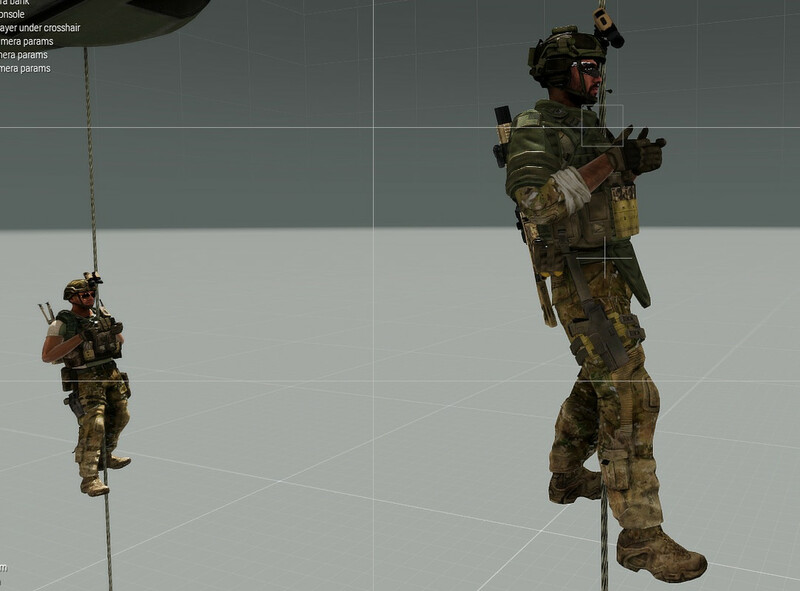 The ability to set flyinheight to your destination is key depending on the type of insertion you are doing (fast-rope, rappelling, paradrops, etc.). It would be nice to have the option low 200, medium 400, high 1000. Also, depending on the enemy your going to encounter. Well, if you don't mind few more mouse actions, then no problem, apart from user config variable, I can make it possible to change flyInHeight also on-the-fly. At any time even, at least during pending troops transport call. I feel, in the future some small piece of GUI would be in order to control these things, but for now may be too little time for such luxuries. into the script thanks to your guy's ideas and feedback. Armaholic is pending with the v1.1 update. v1.1 features and functions, video also added to the OP. dedication and know how this script would not be possible! Thank you for the script. I hope you and Rydygier had a great X-mas. of days until we get enough feedback, and any bug reports on the script, so let us know how it plays for you. or a supply drop, and called again to the same area or position, the pilot will remember the location and not ask for a signal. Cheers! then please report it so Rydygier can take a look and see whats going on, be back with the update. Cheers!